Wind is the movement of air from areas of high pressure to areas of low pressure. Wind is air that is moving parallel to the ground. Air that is moving up or down is called a current as a convection current. Winds are caused as the sun is heating up the atmosphere. Some places receive direct rays and others receive indirect rays. Where the direct rays are, the climate (air) is warmer, however where the indirect rays are, the climate (air) is cooler. The warm air rises as the cool air sinks. This movement causes wind to blow. There are two main groups of winds and those two groups are called local winds and global winds. Local winds are caused by the unequal heating of Earth's surface. Local winds occur a lot at the beach. There are two main groups of local winds that occur at the beach. They are called Land Breezes and Sea Breezes. A land breeze is a breeze coming from land and ending at a body of water. A land breeze occurs during the day because land heats up faster than water. A sea breeze is the complete opposite of a land breeze. A sea breeze is a breeze coming from a body of water and ending at land. A sea breeze occurs during the night because it cools down slower than land. Global winds are created by unequal heating of Earth's surface in a large area. Global winds move across our entire planet "globe".These types of winds can cover very large areas. We all know that Earth rotates from east to west. Earth's rotation makes a global winds curve. That curve is called the Coriolis effect. The Coriolis effect causes winds in the northern hemisphere to curve towards the right. It causes winds in the southern hemisphere to curve to the left. One type of global wind are called Doldrums. Doldrums are winds that occur at the equator. These winds are very weak. They are very similar to Horse Latitudes which are also global winds. They are similar because they are both very weak. They are different because they occur at different places. 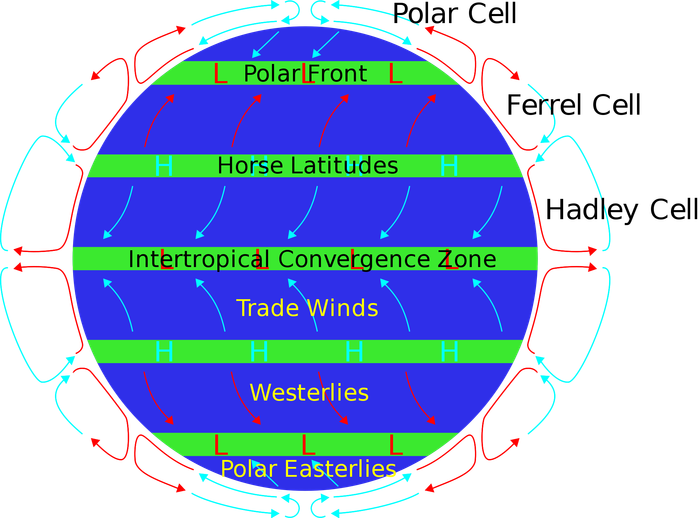 Horse latitudes occur at latitudes of 30 degrees north and south. Another type of global wind is called the Prevailing Westerlies. Prevailing westerlies lie between 30 and 60 degrees north and south latitude and blow from the west to the east. Another example of a global wind is called the Polar Easterlies. Polar easterlies are winds that blow from the north and south pole. My last example of a global wind is called a Trade Wind. Trade winds are winds that lie between 0 and 30 degrees latitude and are really strong winds. Sailors used to used these winds to help them sail and trade goods.